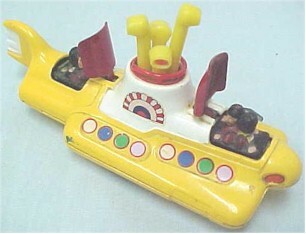 The Yellow Submarine is in excellent condition with only a few small paint dings on the vehicle. Decals are mostly intact. One fin is broken off of the propellor. John, Paul, George and Ringo are all present and accounted for (although 3 of them have very slight paint wear on their hair), and both spring-activated mechanisms still work. 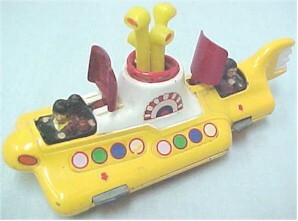 The spinning periscopes still rotate as you roll the sub along. I was at a toy show last month and these were selling, with box for $1500! !